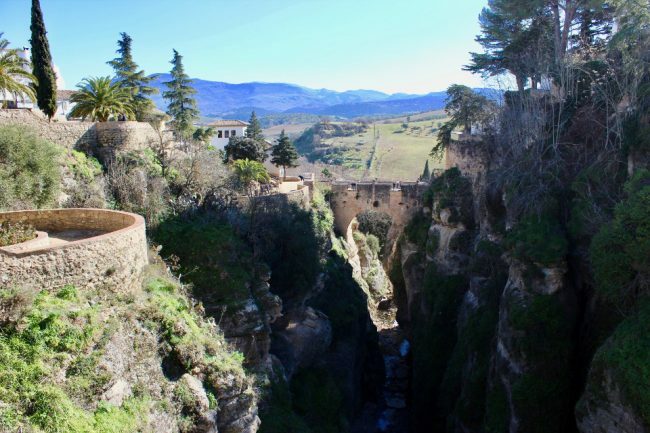 You can easily visit Ronda as a day trip from Málaga, and this is what a lot of people do. I wish I could tell you to stay overnight because the city becomes magical after the tourists have gone, but I can’t. You see, I was here in January, and it was so cold that during the three days I spent here, I never ventured out after sunset! In this post, I’ll describe a route that can be done over a single day while hitting all the highlights, but by all means stay longer if you can spare the time. Ronda is literally a three-dimensional city, and an extra day or two will allow you to explore in a more leisurely fashion. The easiest way to travel to Ronda from Málaga is by bus. Company Los Amarillos runs several buses every day in both directions, starting at 8:00 AM and costing 10.71 Euros each way. The last bus back to Málaga leaves Ronda at 7:45 PM. The ride takes about an hour and 45 minutes, leaving you a maximum of 10 hours to visit the town. If you’re starting from Sevilla, you may wish to spend the night, as the bus trip is 2.5 hours both ways, making it a bit long for a day trip. Or if you’re really pressed for time, you could join a day tour. Visit on a weekday if you can, as the attractions close as early as 3:00 PM on weekends. And wear good shoes as most streets are made of rough cobblestones. This route gives you the best light for photos, assuming that you start your visit in the morning. From the bus station, walk south to Calle Jerez then go one block east. Across the street, you’ll see the gardens of Alameda del Tajo. Wander through until you reach the far end, for stupendous views over the surrounding countryside. 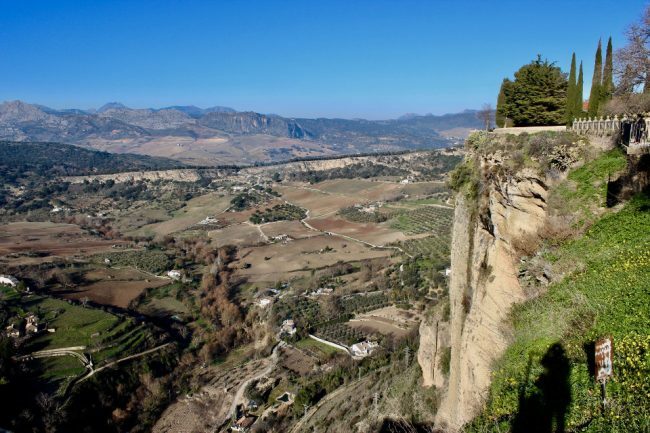 Ronda is built on top of a limestone plateau cut by a 120-metre deep gorge. Its greatest highlights (besides the iconic bridge) are the views it affords in every direction. Keep walking east along the promenade. You’ll soon come to Plaza de España and its Plaza de Toros (bull ring), one of the oldest and most revered in Spain. The Tourist Office is also here. Pick up a map if you don’t have one already. You’ll probably hear about the combo ticket that lets you visit four attractions for 8 Euros. With only one day, I’d give it a miss, as only two of these attractions are really worth the time: the Arab Baths and the Museum of Ronda. Keep following the edge of the cliffs until you reach the parador (luxury state-owned hotel). 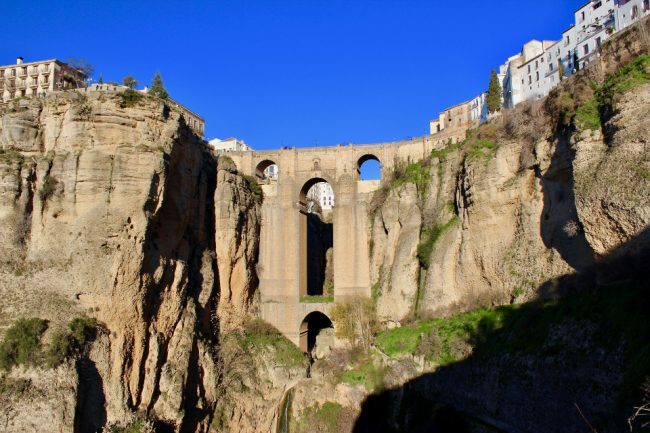 After you round the corner, you’ll get your first look at the Puente Nuevo (New Bridge), the iconic landmark of Ronda. It’s the most recent of the three bridges, linking the New Town (where you’re standing) to the Old Town. This is Europe though, and this “new” bridge was completed in 1793 after over 30 years of work. Walk across the bridge and check out the view from the observation terrace on your left. From here you can see your next destination: the multi-level Jardines de Cuenca. Cross the bridge back into the New Town, and take residential Calle Rosario on your right. Turn right again on Calle Los Remedios, then make another right turn on the small street that leads to Jardines de Cuenca. These gardens afford views of both the New and Old Bridge, from different angles and heights. Around mid-day, the walls of the gorge are more evenly illuminated, allowing better photos. Walk down the gardens to the Old Bridge (16th century) and cross it into the Old Town. You’ll see the Arab Baths down below, well worth the 3.5 Euros admission. These are some of the best preserved Arab Baths in Andalusia, dating from the 13th and 14th century. In what used to be the “hot room”, a short film (alternatively in Spanish and English) illustrates how the baths would have operated in their heyday (including the poor donkey who had to walk in circles all day to power the machinery that provided water to the baths). Once you’re done, continue walking along the city walls. You can climb up in some places for more great views of the countryside and the New Town, whose white houses spill down the hillside. When you’re ready, take one of the narrow streets that lead back into the medieval Old Town, where you can have fun exploring the warren of narrow pedestrian streets. 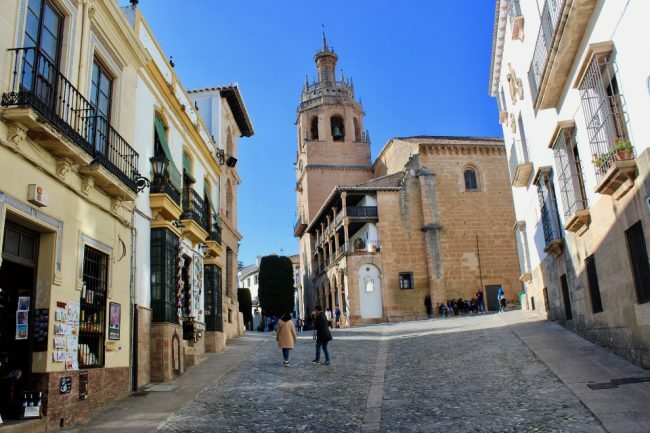 Two more worthwhile stops in the Old Town are the Museum of Ronda (in the Mondragón Palace) and the Church of Santa Maria La Mayor, which used to be the city’s mosque during the Arab era. Admission is 3 Euros and 4.5 Euros respectively. The museum covers the entire history of Ronda, starting in prehistory, but be warned that the building is not heated in winter, and it is frigid. Visiting in January, I was so uncomfortable that I had to leave after half an hour. (If you’re a EU citizen, admission to the museum is free on Tuesdays after 3 PM). The museum’s gardens provide more beautiful views over the cliffs. Just north of the museum, a path descends outside the wall, and after 10 minutes or so, leads to a couple of viewpoints from where you can take great pictures of the New Bridge. If you time it so that you’re here about an hour to an hour-and-a-half before sunset, the sun will illuminate the bridge perfectly for photographs. This concludes the tour of Ronda in one day. If you still have some time, you can explore some of the commercial streets in the New Town before catching your bus back to Málaga or Sevilla. Make sure that your accommodation has proper heating if you visit in winter. A lot of the older building don’t, and night temperatures can drop below zero in January! I was told that the best months to visit weather-wise are May and September, which are dry and sunny with temperatures above 25 degrees, without being too hot. Given the amount of tourists visiting in winter though, I can only guess how busy these ideal months would be. Recommended guidebook: Lonely Planet Andalucía. If this sounds too complicated or you don’t speak any Spanish, consider visiting Ronda as part of a group trip through Spain.